My photography has taken a slight turn for the next month. Instead of the familiar skyline of Austin or colors of the Texas Hill Country, or even colorful Texas Wildflowers, I am in the Rocky Mountains for the next month shooting high mountain locations, colorful Colorado wildflowers and cold running streams. Thus far, I’ve trekked to southern Colorado near the town of Lake City (with a lifelong friend) and hiked our 26th 14,000 foot peak (Handies). Prior to that, I made a quick trip to capture North Clear Creek Falls between Lake City and Creede. While hiking Handies Peak, I stopped to smell the flowers, this time Colorado’s state flower, the Columbine, in American Basin. After a nice hike, we drove the hair-raising 4WD Cinnamon Pass from Lake City to Silverton. This was certainly a white-knuckle experience, and I was sure glad it was over when we pulled back onto the highway near Silverton. We drove on several switchbacks where I had to back up my 4-Runner a few times in order to make the hair-pin turn. The shelf roads that were barely wide enough to fit my car, complete with 1000 foot drops on one side, were not pleasant, either. 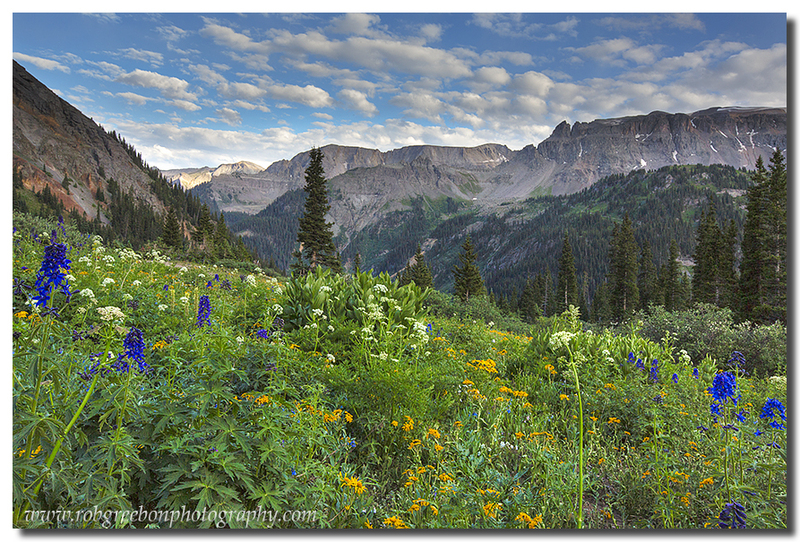 We did make it to Ouray where we drove up the 4WD road to Yankee Boy Basin. Here, we enjoyed more Colorado wildflowers. The next morning we hiked up to the Blue Lakes just outside of Ridgway (11 miles north of Ouray). These lakes provided views and offered one of the prettiest hikes I’ve ever experienced in Colorado (and I’ve been spending summers up here for 20 years). 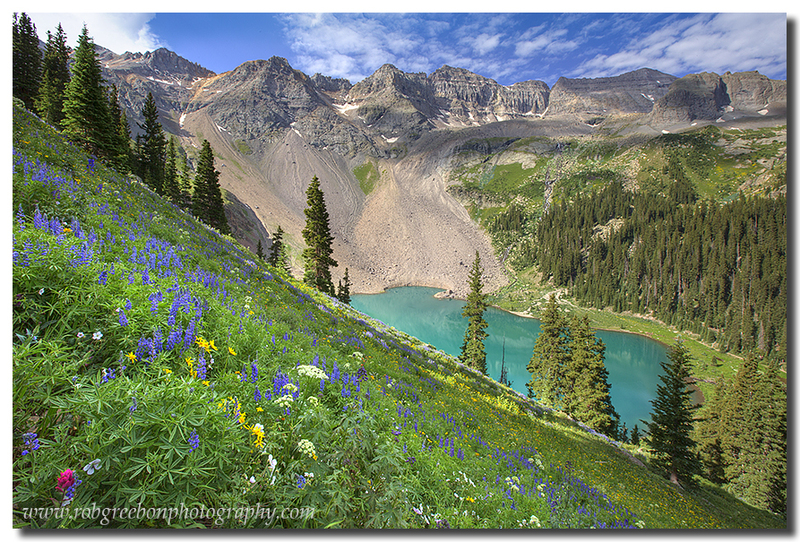 The wildflowers along the slopes were magnificent, as were the turquoise lakes. I’ll return to Austin soon, along with the humidity and heat that entails. I’ve already got a few shoots lined up for my return. Before that return home, I’m going to enjoy these 70-degree afternoons, beautiful mountains with their colorful wildflowers, and the afternoon rains that come with Colorado’s summer monsoon season! The drive up Yankee Boy Basin is a bit bumpy, but the Colorado Wildflowers and views of the mountains are pretty amazing. The hike up to the Blue Lakes is not far – only ~ 3.5 miles – and the payoff is amazing views of Colorado’s summer wildflowers and turquoise lakes.